The dress above was made by Darlene, she used sunny colors and I love the way it turned out. 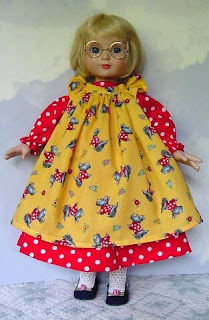 This E-Pattern is for the 19 inch Robert Tonner Ann Estelle doll. It is patterned after the outfit that the Baking Gingerbread Doll came in. I have this doll and love her! She is the perfect 19 inch doll. 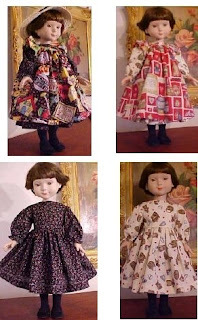 This pattern will also fit popular 18 inch dolls. The way it is made up, you can use flannel or any type of fabric to give it a different look. The dress itself is very easy to sew up, the apron is a little more involved, but well worth the effort. Please email me at pamamom@gmail.com if you would like a copy of this pattern.